When T cells recognize virus-infected cells, what they’re actually “recognizing” is a short peptide that’s stuck in a class I major histocompatibility complex. The peptide sits neatly in a groove formed by two helices on top of a beta-sheet (“a hot dog in a bun”, students are told in immunology class, though to me it doesn’t look much like that).1 On the left, there’s a diagram of this groove with no peptide associated — on the right, with its peptide tucked in — and below, there’s a space-filling view (from a different angle, but till looking “down” at the MHC surface, the way a T cell would be “looking”). 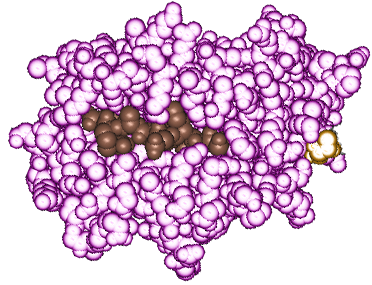 In this last view I’ve made the MHC atoms outline; the peptide is in brown, so you can see how tightly packed the peptide is. The “groove” is a pocket as much as a groove, and the peptide is buried fairly deeply within that pocket, with only its top surface exposed for T cells to look at. 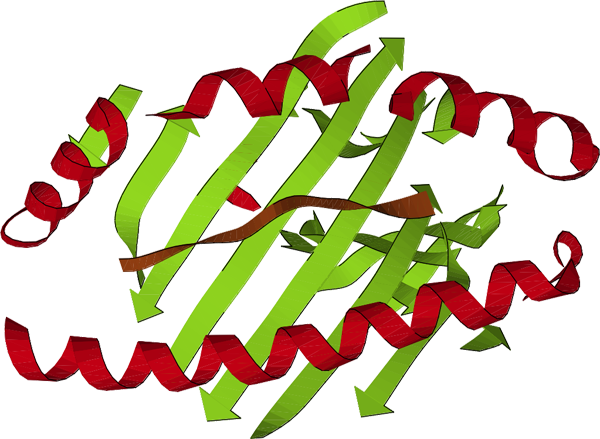 How does the peptide wiggle into that slot? You can imagine that it would have some trouble just clicking in, like a Lego (TM) piece. What probably happens normally is that the pocket in the MHC is held in a more open configuration (the MHC class I is partially but not completely folded) until the peptide starts to settle in, and then the MHC actually finishes folding around the peptide. (There’s only circumstantial evidence for this, but it’s always hard to look at folding intermediates directly, even when they’re relatively long-lasting.) 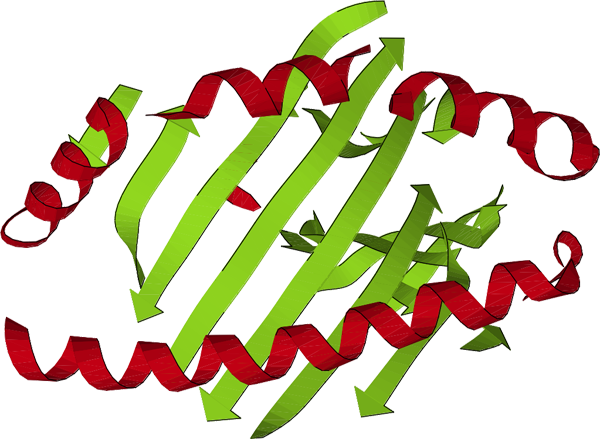 You’d expect that an accessory molecule, or molecules, might be involved either in the “holding open” phase, or in the “folding around the peptide” phase, or both. This observation suggests that the mechanism underlying peptide editing involves a reiterative process in which peptide displaces conjugate and conjugate displaces peptide until a sufficiently high affinity is reached that peptide remains associated. This seems remarkably similar to the function of HLA-DM in MHC class I peptide assembly. This entry is filed under Antigen processing, Science. You can follow any responses to this entry through the RSS 2.0 feed. Both comments and pings are currently closed.